SPARKLE – IN THEATERS NOW | STREETS OF NEW YORK 411 INC.
Let’s continue to show our support for these types of films and help make it #1 this weekend. Sparkle is an American musical film directed by Salim Akil and produced by Stage 6 Films, It was released on August 17, 2012 by TriStar Pictures. 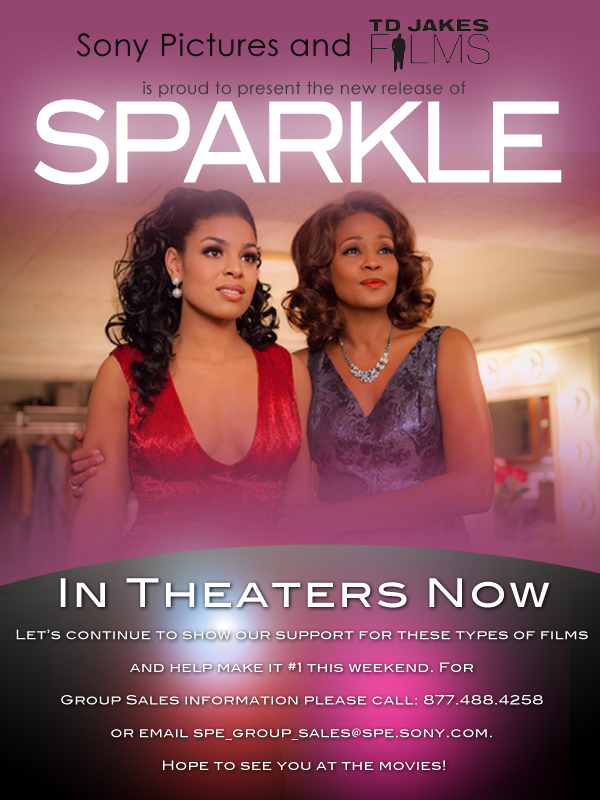 Inspired by The Supremes, Sparkle is a remake of the 1976 film of the same name, which centered on three singing teenage sisters from Harlem who form a girl group in the late 1950s. The remake takes place in Detroit, Michigan in the 1960s during the Motown era. The film stars Jordin Sparks, Derek Luke, Whitney Houston, Mike Epps, Cee Lo Green, Carmen Ejogo, Tika Sumpter, Tamela Mann and Omari Hardwick. Sparkle features songs from the original film written by soul musician Curtis Mayfield as well as new compositions by R&B artist R. Kelly. This film is the debut of R&B/pop singer and American Idol winner Jordin Sparks as an actress. Sparkle also marks Whitney Houston’s fifth and final feature film role before her death in February 11, 2012, three months after filming ended. The film is dedicated to her memory. Set in the 1960s, three sisters form a girl group and soon become Motown sensations, against their mother’s wishes. But fame becomes both a challenge and an obstacle, as the close-knit family begins to fall apart due to this. But one girl, Sparkle, senses some hope for her future, despite every circumstance.